Marigot is a small, leafy fishing village on Haiti's south coast whose size belies its importance on a land/sea trade route stretching from the Dominican Republic to Port-au-Prince. Twice per week, on Tuesdays and Saturday mornings, a fleet of small wooden boats arrives in Marigot from the border town of Anse-a-Pitres and the coastal town of Belle Anse. These boats come laden with salami, flour, coconuts, and bundles of used clothes from the Dominican town of Pedernales. Approximately fifty fishermen from Belle Anse and Anse-a-Pitres send coolers full of conch, fish and lobster to be sold in the market along with the catches of Marigot's two hundred resident fisherman. When the boats arrive at four am, they unpack their cargo and set up a market on the shore. This trade route and market is longstanding and robust, but it suffers from a cash flow problem that prevents traders from increasing the size of their businesses and presents security risks. 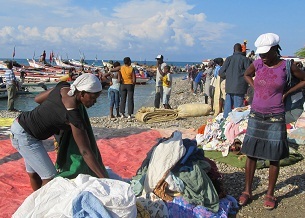 Fishermen find no shortage of buyers, who travel from Port-au-Prince to Marigot the night before to be first on the shore when market begins. But buyers purchase on credit (from multiple sellers) because they do not have the cash to pay until they sell the fish in the Port-au-Prince neighbourhood of Martissant. We interviewed the head of a Marigot fishing co-operative, Vitho Jouissance, who said that he did not know of a single case in which a buyer paid for his purchases up-front. 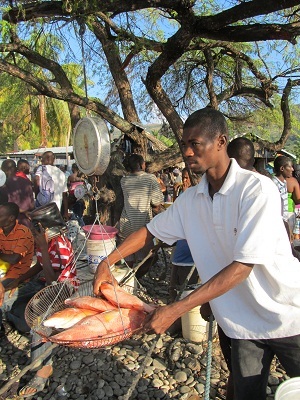 Fisherman only receive their money when the buyers return to Marigot three or four days later for the next market. The used clothing trade operates in a similar manner, but sellers generally only extend credit to larger buyers or people they know well. Three or four days until payment might not seem like much of a delay, but profit margins in the fishing industry–and, indeed, the entire town–are tight. Until they are paid for their catch, fisherman can't pay for the fuel they bought on credit or buy more to go fishing again. The entire town experiences a knock-on effect because fishermen must also purchase their household supplies on credit. Buyers are much better off because they can use their surplus cash for a few days before they have to repay the fishermen. But upon returning to Marigot they face the security issue of carrying from 20,00 to 40,000 gourdes (US$500-1000) with them. One fisherman told us that the risk of carrying cash sometimes serves as an excuse for delaying payment. He said that sometimes buyers will pay for their entire purchase the first time they buy; pay half the second time, and the third time they will claim to have been robbed while travelling over the mountain. So, even if robbery remains merely a threat, it can damage trade and profit in the fishing industry. Mobile banking provides obvious benefits in this situation. If there were agents in the major towns along the entire trade route (in Port-au-Prince, Jacmel, Marigot, Belle Anse, and Anse-a-Pitres) then buyers could send money directly to the fisherman on the same day that they bought the fish. Fishermen could then pay their bills and immediately start fishing again. Money would not have to undergo the risk of crossing the mountains; nor would it have to travel back to Belle Anse and Anse-a-Pitres on open wooden boats that occasionally sink. There are technical limits to how the fishing industry can use mobile banking in its current form. 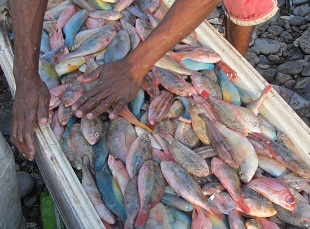 TchoTcho Mobile's maximum transaction size of 10,000 gourdes (US$250) and monthly transaction limit of 60,000 gourdes (US$1500) means that fish buyers could not use the service to pay all their sellers. In fact, the smallest buyer could only pay for 40% of his purchases using mobile money, and the largest seller could pay just 20%. With T-cash, these limits are 2500 gourdes using the mini-wallet. This problem could be partially mitigated by a buyer signing up for multiple mobile money services. One option would be for the fishing cooperatives to insist that payments to fishermen who live the farthest away are prioritised (it takes an extra day for money to arrive to Anse-a-Pitres). Mobile money's wallet size does not present a problem for the majority of small traders who inhabit the region, such as the many peasant women who travel down from the mountains to the market to sell plantains, beans and corn. Jacmel's artists could receive their pay directly from Port-au-Prince. Rapid payment would allow small traders and merchants around the towns to pay their debts and buy more stock. Customers, knowing that they can receive money quickly from other parts of the country, might have more confidence and buy more than they normally would. And families who currently conduct money transfers by boat could rest assured that their relatives are receiving their money quickly and safely. A simple piece of already-existing technology could greatly enhance the prosperity of the towns along this trade route. --Photo #1: Weighing fish in Marigot's market. Photo by Erin B. Taylor. --Photo #2: Esky of fish destined for Port-au-Prince. Photo by Erin B. Taylor. 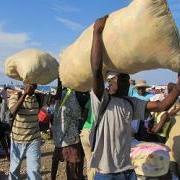 --Photo #3: Carrying commodities off the boats. Photo by Erin B. Taylor. 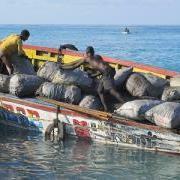 --Photo #4: Unpacking the boats from Anse-a-Pitres. Photo by Erin B. Taylor. --Photo #5: Sorting through used clothes from Pedernales.Photo by Erin B. Taylor. There is no doubt that Haiti all businesses can benefit from mobile money, we only hope that this thing can become popular and well used since the population really need it.